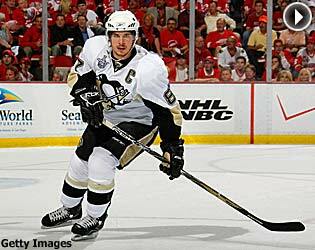 Sidney Crosby guided his young Pittsburgh Penguins team all the way to the Stanley Cup Final in 2007-08. The Pens fell to the Detroit Red Wings in six games, but have the pieces in place to contend for the Cup for many years to come. The Pittsburgh Penguins ended their season by watching the Detroit Red Wings skate around Mellon Arena with the Stanley Cup. It was a tough way to conclude a season that saw the Pens make the Final for the first time since completing a sweep of the Chicago Blackhawks in 1992 to repeat as champions. Still, under Michel Therrien, the Penguins had a tremendous season for a club two years removed from finishing 29th in the League. "Even when we were struggling two years ago, you could kind of see the pieces forming here — that we'd be a good team in time, with a little patience," defenseman Rob Scuderi said. "To see us mature so quickly has been awesome to be a part of." The Penguins have gone from awful to awesome in two years, and the primary reason is Sidney Crosby, who has been everything he was touted to be when the Penguins won the Draft Lottery and chose him with the No. 1 overall pick in the 2005 Entry Draft. Despite missing 29 games due to a high ankle sprain that won't completely heal until the offseason, Crosby finished with 72 points in 53 regular-season games, then tied Detroit's Henrik Zetterberg for the playoff scoring lead with 27 points. Crosby turns 21 this summer and appears headed for superstardom, if he's not there already. "He's a young player, and yet he's mature beyond his years," an admiring Detroit coach Mike Babcock said during the Stanley Cup Final. His teammates appreciate everything their captain brings to the game. "He's been awesome," Scuderi said. "Just his drive – even if it's not going for him offensively, you know he's giving absolutely everything he's got. That's all you can ask from your captain, and he's given that every night since he's put on the jersey." Crosby's injury turned out to be a blessing in disguise for Evgeni Malkin, and the 21-year-old Russian took the opportunity to be the leader of the offense and ran with it. Though he struggled in the latter stages of the playoffs, Malkin still had a brilliant season with 47 goals and 106 points — second in the NHL to Washington's Alex Ovechkin and good enough to make him a Hart Trophy finalist. Like Crosby, the future for Malkin appears unlimited. Marian Hossa's future appears bright as well — but will it be with the Penguins? Hossa was GM Ray Shero's big deadline-day acquisition, but played just 12 games for the Penguins during the rest of the regular season, largely due to injury. But he was superb in the playoffs, finishing with 12 goals and 26 points in 20 games. He's an unrestricted free agent, and while he meshed well playing with Crosby, he's coming off his poorest season since 1999-2000 and might not fit into the Pens' budget. The Penguins could also lose Ryan Malone, whose 27 goals and 51 points were career highs and whose willingness to play through pain after breaking his nose twice in the Final demonstrated his grittiness. Pascal Dupuis, who came with Hossa from Atlanta, is another UFA who could leave. But the Penguins still have help for Crosby. Second-year center Jordan Staal dropped from 29 regular-season goals to 12, but played well in the playoffs and is a rising star. Feisty Maxime Talbot had 12 goals and 26 points while annoying opponents, and may have taken a step forward with his game-tying goal in Game 5 of the Final. Petr Sykora had 28 goals and 63 points during the regular season, and helped make up for an inconsistent postseason with the winning goal in the third overtime of Game 5 against Detroit. Defensively, the Penguins are solid, if not spectacular. Sergei Gonchar, known most of his career solely for his offensive skills, played the best defensive hockey of his life while remaining among the NHL's top point producers on the blue line. Ryan Whitney's performance in Game 5 against Detroit, in which he played 50:46, could be a career-defining moment. Scuderi and deadline-day acquisition Hall Gill provide oomph in their own zone and will become more important if pending free agent Brooks Orpik, another physical presence in his own zone, opts to go elsewhere. The Penguins will need more next season from 21-year-old rookie Kris Letang, who had six goals and 17 points in the regular season but struggled in the playoffs and was benched in favor of 36-year-old Darryl Sydor after Game 2. Letang has the type of offensive skills that should thrive with the talent the Penguins have up front, and his defensive game is progressing adequately. The playoffs may have been a coming-out party for goaltender Marc-Andre Fleury, who played every game of the postseason and put up a 1.97 goals-against average, three shutouts and a .933 save percentage. His 55-save performance gave the Penguins the opportunity to win Game 5 of the Final on Sykora's goal. Fleury, who also missed much of the season with a high ankle sprain, finally lived up to his status as the No. 1 overall pick in the 2004 Draft. "It just gives you a sense of confidence when your goaltender is that strong," Crosby said of Fleury. "You know he's going to be there to make key saves. And he just gives you that extra boost. It feeds to everyone else and gives you a certain sense of confidence, so we have that especially with him back there." The 2007-08 season was a breakout one for the Penguins, a team that hadn't won a playoff series since 2001 or a division title since 1998-99. The hard part will be building on their sudden success while keeping the roster together and letting the team's talented young players mature. Having come so close, there's only one more hurdle to climb. "It was a huge year for us," Crosby reflected to the media a couple of days after the Game 6 loss in the Final. "We gained a lot of experience pretty quickly. We said we wanted to bounce back from last year and have a better season and we did that. We came so close, but I think we all realize how tough that was and we don't want to feel it again. Hopefully, we can have another chance and have a different outcome."